Your little Turtle needs time to adjust to the idea of this huge life change before feeling comfortable enough to actually attempt using the potty. The good news is that Turtles are persistent, creative and fiercely loyal. If you lead the way, the Turtle slowly but surely follow. To help you learn how to speak to your Turtle about the potty, we've put together some simple potty scripts. I’m setting your little potty here by the sofa. We’re not going to use it until YOU want to. If you want, you can sit on it, but with your clothes on, just to see what it feels like. It looks like you have to poop. Here in the market, the potties have automatic flushers, those loud ones. Wanna try here? Maybe we can just look in there and see how you feel? If not, let’s find you a quiet place where you can poop in your Pull-Ups®, and I’ll change you. Then we can wash our hands in the bathroom — and just LOOK at the loud potties to check them out. Try sitting backwards on the big potty — facing the tank. That will help you feel safer. Hey, want to try flushing the toilet, just for fun? Let’s see what happens when it swooshes. Can you pull out some toilet paper for me? You’re my official helper! Let’s go on a potty mission and find the potty at Aunt Linda’s house. Is it here? Over here? Ah, now we know where to find it when we need it later! Look at that doggie making a big poop! She looks like she feels so much better now that she's gotten it all out of her! After our walk, maybe you can try to get your poops out, too! Your sheets are wet. Let’s get you cleaned up. 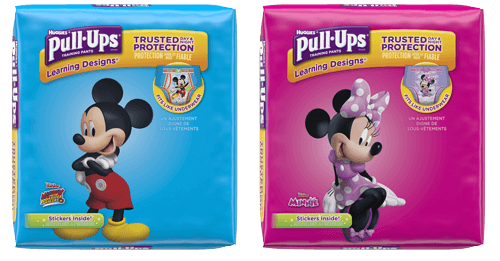 Don’t worry; being potty trained at night is a lot different than during the day. I see you sometimes like to hide while making your poop. Help me find a spot where we can put your little potty so you feel you can have privacy when you try on the potty, too. Give a lot of reassurance to your little Turtle. Turtles are very observant and notice every little thing that changes in their environment — and it can make them feel insecure. Sometimes, your little Turtle is just trying to hang on to some semblance of a predictable life, and diapers have been a big part of it so far. Gradual exposure is key for Turtles. Nonchalantly introduce a potty to the bathroom. Have your Turtle spend a few minutes without a diaper to see how it feels. Allow Turtles to witness the rest of the family’s bathroom habits. Don’t get too pushy, or your Turtle will balk. Letting her feel in control is the way to follow your Turtle to potty success. Make sure your little Turtle doesn’t avoid the potty, which can trigger painful constipation. At school, provide your Turtle with comforts from home, like a familiar blanket for rest time. You may also want to explore the scripts of our other potty personalities to see which work best with your own child.